Did you know that today is Alien Abduction Day? It’s true! Dark Horse Comics founder Mike Richardson knows it — and he’s here to talk about extraterrestrials, Project Black Sky and his own childhood Close Encounter! 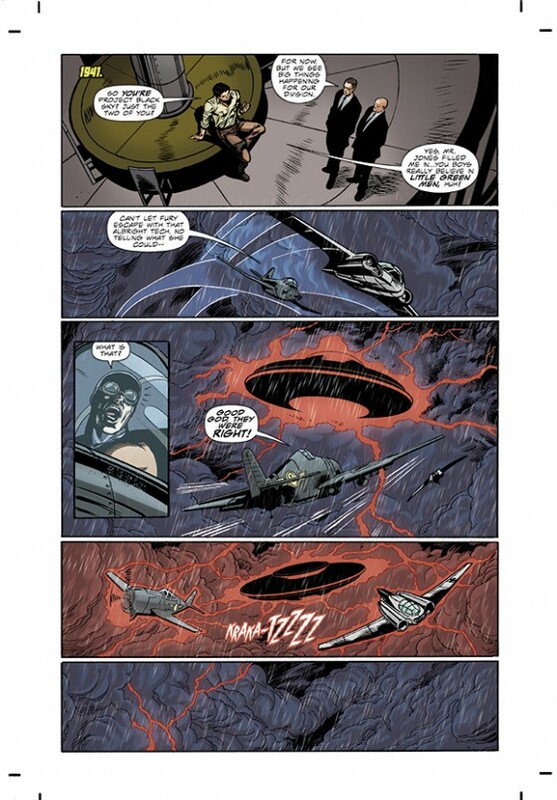 Dan Greenfield: What you can tell us about the history of alien abductions in comics and, of course, how it all relates to Project Black Sky? 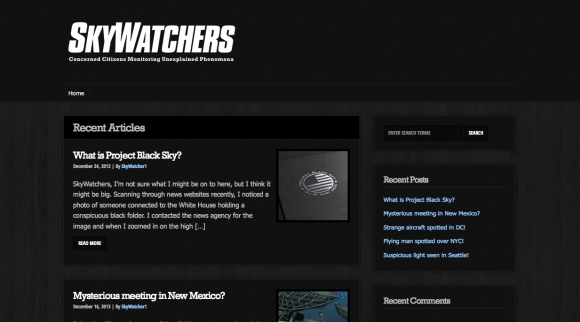 Mike Richardson: Well first of all, if you’ve gone to our SkyWatchers website, you can see that there’s a lot of alien conspiracy theorists sharing, particularly our SkyWatcher, our mysterious SkyWatcher, sharing information that seems to be happening in the Project Black Sky world. But when we’re talking about comic books, obviously there’s a grand history of alien abduction and maybe not always the way you think about it. In the history of comics, the universe is a small world and, if you understand what I mean, there’s aliens all around us and everywhere. In fact, in the world of superheroes, there’s aliens everywhere. The most famous superhero ever created is an alien. I don’t know if you realize that but Superman comes from another planet. Yes, of course. (Laughs) I did realize that, yes! So the first hero that comes to Earth and is celebrated generally as the first and greatest superhero before the term was even created was an alien. Then you go through the history … when you talk about alien abduction, there’s been numerous characters that have been captured by aliens because so many of the villains in the world of superheroes are aliens — Brainiac, for instance, one of Superman’s arch-enemies, is an alien. … When you’re talking about abductions and assorted heroes, it’s a regular thing. I remember Alan Grant and Norm Breyfogle did a Batman series called “The Abduction,” in which Batman gets abducted by aliens. When you talk about our own characters, you’re talking about, for instance, Captain Midnight. Well, originally Captain Midnight was a pilot back when he first appeared. It was in Dell Comics. Then he sort of graduated to more of a superhero and pretty soon was wearing glider wings and could fly. But originally he was involved in the war and as World War II came to a close, they needed something exciting to keep the interest in the book up so Captain Midnight, you suddenly found him battling aliens on a regular basis. In fact, he became the monarch of the spaceways as opposed to the monarch of the skies so then evidently he could battle aliens on other worlds. So Captain Midnight has a history of battling aliens. In Brain Boy, there was an invasion, a different kind of an abduction. In the original Brain Boy that was published back in the ‘60s, there were microscopic aliens that infected a particular lake and when people went swimming, they literally took over the body, so a different kind of abduction. The whole body was taken over by microscopic aliens. What is this gearing up for? I know that Free Comic Book Day is going to have a big Project Black Sky presence and all of these books are eventually going to tie in to each other. Is this going to be basically our heroes against the aliens or what can you tell us? Well, without giving too much away, because we want to unravel this as we go into the stories, there is something that happened in the ‘30s that is responsible for the creation of the Black Sky Project. And the Black Sky Project has used other organizations as a front, for instance Project Blue Book and the Majestic-12 if you’re familiar with any of those terms. These were true-life groups that were given a task of investigating UFO reports. But the deep organization is Project Black Sky and we’re gonna be finding out what they’re after and why they’re after them and the events that start in the ‘30s — the focal point for our whole storyline — begins when Captain Midnight, who is basically a ‘40s character, chases a UFO and pops out in the 21st Century, in our day. 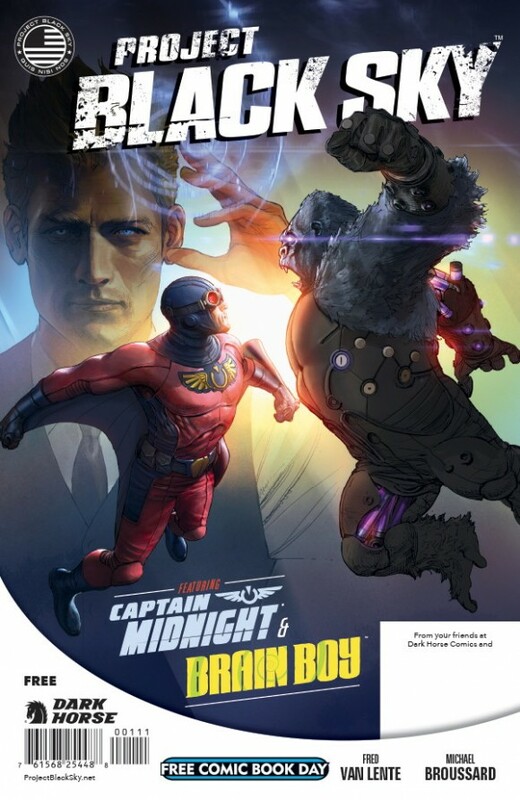 From that moment he pops into our world, suddenly our real story starts, which was the first (that) took place in the very first Captain Midnight story for Dark Horse. And now all of these elements are going to start becoming clear. All of these sort of characters that we have, these world organizations, these deep government organizations, all of a sudden he is the catalyst for all of this starting to make sense and suddenly we’re seeing what’s going on. And we’re going to find out that there may be aliens among us and there may be people disappearing, there may be people being replaced, and any number of things that can be going on. Grand conspiracies will be explored. From Captain Midnight #6. Writer: Joshua Williamson. Artist: Eduardo Francisco. Let me clarify something. The two projects that you mention, because I have to admit I don’t know everything there is to know about alien conspiracies … Project Black Sky is obviously an invention that you guys came up with but the other two that you mentioned were real-life investigations? Yes, Project Blue Book is the Air Force’s study of UFOs and there’s many, many, many pages of … or many, many documents that came out of that. I think it was suspended sometime in the ‘80s I believe. I don’t remember exactly but they finally suspended it at some point. The Majestic-12 was another group that they put together to … there’s different theories, either to pooh-pooh the UFOs phenomena or to find out what was behind it. You sound well-versed in it. Is this something that comes naturally for you? Is this something that you’ve historically been interested in? I’ve always been interested and now I go into the fringe lunatic. (Dan laughs) I’m not obsessed or anything. I’ve just had a sort of a casual interest in it and it seemed like good story material. We tried to figure out an interesting way to introduce our heroes. I will say that when I was 10 years old, I was growing up in Milwaukie, which is in Oregon, which is mostly farm country and woods, and we saw something we at first mistook for the moon but a few minutes later while riding to the store for my mom on my bicycle with a buddy of mine, on the way back we saw it: It was very large and it was a disk. The outer part was spinning. We raced into my driveway and got my mom out and we watched it hover over the house and then suddenly shoot up and be gone in about a second. So I have no idea what that was. I don’t know that it was alien spacecraft. All I know is what I saw so I’ve always waited for someone to explain it to me and sort of looked to see what it could be, ’cause you see UFO reports and you see lights in the sky and you see things in the distance that you can’t explain. We saw a Ray Harryhausen UFO. I don’t know what it is. That’s why they call them UFOs. They’re unidentified flying objects. They’re not necessarily alien spacecraft. So whatever I saw, we saw it and that accounts for a casual interest only to see is there an explanation for what I saw? I don’t speculate what it was. But as a result over the years, even though I’ve had a casual interest, I know some of these terms but obviously when I started putting together this universe, when I was writing the original document and outline behind it, now I know a lot more than I did then. 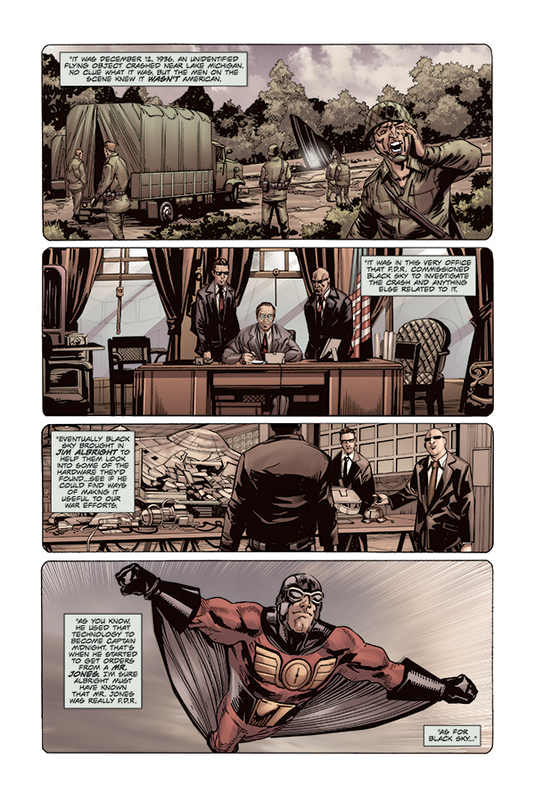 From Captain Midnight #3: Writer: Joshua Williamson. Artist: Fernando Dagnino. It very well could change. I’m not gonna give it away but the origin of the aliens may be different than people expect. But not if you follow Art Bell, which suddenly I’ve been listening to lately and it’s a lot of fun. Some pretty crazy stuff but it’s not far out to some of the UFO conspiracy theorists. 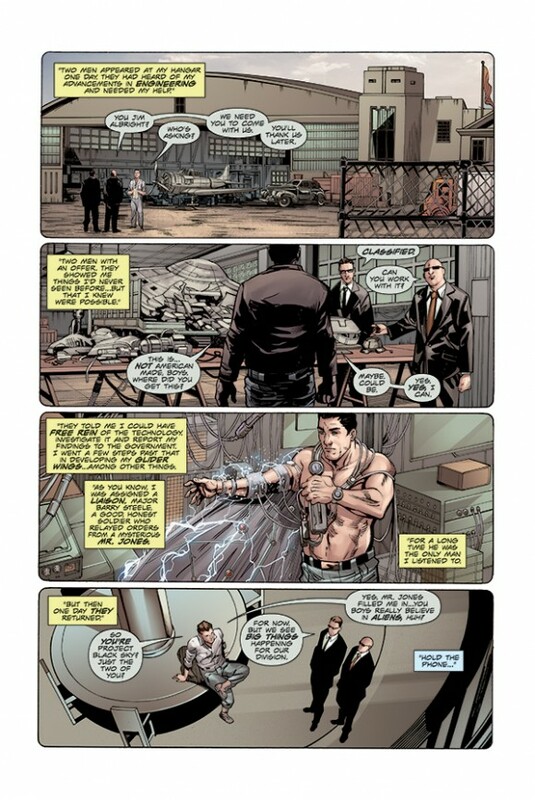 From Captain Midnight #7. Writer: Joshua Williamson. Artist: Eduardo Francisco. This is great, though. I love the way you’re kind of mixing the real-life conspiracy theories and the real-life UFO sightings with the fictional elements of these characters. … Was this your vision to put all this together? How did it develop? Yeah, I had worked on it for a couple of years, certainly building the framework to launch our heroes, deciding which heroes were gonna be involved with it. We went after some public-domain heroes to see if they were available and it turned out they were and just basically built up a cast of characters, built a framework around them to exist in, then I sort of put bios of each character into the world and how they fit in. Then we brought in our writers, put our staff together, the editors that were going to work on the series. Then we approached our writers and tried to give them enough room where they could be creative and yet keep within the story outline that we had laid out for them, the larger plan. Now are there going to be more name characters or familiar characters who are gonna be introduced in the line? Yes. Yes, there are. The answer is yes. There’ll be continually launches of characters. Some will come in and some will go. You’ll actually see, believe it or not, some of them die! Tell me what’s to be expected in the big Free Comic Book Day issue. I know that that’s going to be a big deal for you. Well, (the FCBD book) Project Black Sky is going to sort of reveal … there’s gonna be some reveals of what Project Black Sky is and what the larger mystery is. Aside from this alien mystery that permeates the world, there’re organizations that have come into existence as a result of the technology that was found and we’re gonna find out who the players are and we’re going to find out what the world menace is as we launch that Free Comic Book Day isue, so it’s a great place to start finding out what we’re doing and why we’re doing it. I think our superhero world — this world we’re creating with these characters — I think it’s very interesting and very different from what’s been out there for a very long time. I think we’re trying to create a unique approach and create something that is not copying the other companies that do the same kind of thing. Our promotion on it I think has been very original. You’ll find several different sites that take different approaches to it. I think we’re going to intrigue casual people who happen to stumble upon it and I think those people who like the world of Art Bell are going to like this a lot, too. When Twitter shut you down, what was your reaction? (Dan laughs) You and Ellen DeGeneres broke Twitter! Twice! Mysteriously it’s happened twice. Makes you start believing some of the conspiracy theories where some of these people online say they get shut down every time they try to talk about this stuff. So it happened a second time? Yeah, it happened a second time. Now, are we gonna find out who SkyWatcher is? Ah, that’s a mystery! Do any of us know? Oooooo! All right. One last question. As far as the structure of it, is Project Black Sky going to be sort of like a limited series with the other titles weaving in and out of it or what’s the structure going to take? Project Black Sky is going to be an ongoing book. It’s going to have the organization which will be revealed. And it’s going to have a rotating cast of characters on a monthly basis. So you’ll see characters coming into it from the other books and some new characters introduced that may get books later or may appear in different books. We have a number of events planned to highlight characters that may first appear in the Project Black Sky book. Was there anything else that you wanted to add about it? Anything that we haven’t talked about that you wanted to bring up? No, I just think that if people look at the larger plan, there’s a lot of fun here. There’s the books, of course, that we all like but you can have a larger experience and all the other things that we’re doing and it’s fun to stumble across the websites. There’s several different websites popping up, each one with sort of a different approach. There’s going to be some mysterious things happen out there whenever you see Project Black Sky. We’re hoping we’ll intrigue people to take a look because what we’re doing is gonna be a lot of fun. We’re having a blast doing this. It’s something more than just a company launching a bunch of books. We’re trying to make it a much larger experience so that when people do read the books, they’re gonna have a lot of fun. How are you celebrating Alien Abduction Day on Thursday? I’m gonna go hide in my basement. (Dan laughs.) I’ll read my comics down in the basement so I’m immune from any kind of trip that I don’t want to go on. I have too much work to do.